Mirandornithes (name coined by Sangster (2005)) is a clade that consists of flamingos and grebes. Many scholars use the term Phoenicopterimorphae for the superorder containing flamingoes and grebes. Determining the relationships of both groups has been problematic. Flamingos had been placed with numerous branches within Neognathae, such as ducks and storks. The grebes had been placed with the loons. However recent studies have confirmed these two branches as sister groups. 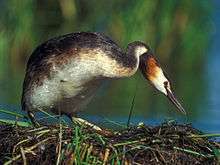 Both primitive phoenicopteriformes and their closest relatives, the grebes, were highly aquatic. This indicates that the entire mirandornithe group evolved from aquatic, probably swimming ancestors. "At least the fourth to seventh cervical vertebrae strongly elongate, with processus spinosus forming a marked ridge. Humerus with a marked oval depression at insertion site of musculus scapulohumeralis cranialis. At least 23 presacral vertebrae. At least four thoracic vertebrae fused to a notarium. Distal end of ulna with marked oval depression radialis. Phalanx proximalis digiti majoris very elongate and narrow craniocaudally. Distal rim of condylus medialis of tibiotarsus distinctly notched. Pars acetabularis of musculus iliotibialis lateralis absent. Pars caudalis of musculus caudofemoralis absent. Left arteria carotis reduced or absent. Eggs covered with a chalky layer of amorphous calcium phosphate." 1 2 Sangster, G (2005). "A name for the flamingo-grebe clade". Ibis. 147: 612–615. doi:10.1111/j.1474-919x.2005.00432.x. ↑ Joel Cracraft; et al. "Justifications of names for higher taxa" (PDF). ↑ Tuinen, Van; Butvill, M.; Kirsch, D. B.; Hedges, S. B. (2001). "Convergence and divergence in the evolution of aquatic birds". Proc. R. Soc. B. 268 (1474): 1345–1350. doi:10.1098/rspb.2001.1679. ↑ Chubb, A. L. (2004a). "New nuclear evidence for the oldest divergence among neognath birds: The phylogenetic utility of ZENK (i)". Molecular Phylogenetics and Evolution. 30 (1): 140–151. doi:10.1016/S1055-7903(03)00159-3. PMID 15022765. 1 2 Mayr, G (2004). "Morphological evidence for sister group relationship between flamingos (Aves: Phoenicopteridae) and grebes (Podicipedidae)". Zoological Journal of the Linnean Society. 140 (2): 157–169. doi:10.1111/j.1096-3642.2003.00094.x. ↑ Fain, M. G. Houde (2004). "Parallel radiations in the primary clades of birds". Evolution. 58 (11): 2558–2573. doi:10.1554/04-235. PMID 15612298. ↑ Ericson, J. I.; Anderson, P. G. P.; Britton, C. L.; Elzanowski, T.; Johansson, A.; Kllersj, U. S.; Ohlson, M.; Parsons, T. J. (2006). "Diversification of Neoaves: integration of molecular sequence data and fossils". Biology Letters. 2 (4): 543–547. doi:10.1098/rsbl.2006.0523. PMC 1834003 . PMID 17148284. ↑ Hackett, S. J.; et al. (2008). "A phylogenomic study of birds reveals their evolutionary history". Science. 320 (5884): 1763–1768. doi:10.1126/science.1157704. PMID 18583609.